Rarely does a teacher have to deliver a lecture knowing they are being watched not only by their students, but by a prominent Lord, the BBC, Ofsted and most of the social work sector. But this has been the reality for Bedfordshire University professor Donald Forrester, the lead academic for the fast-track social worker training scheme Frontline. 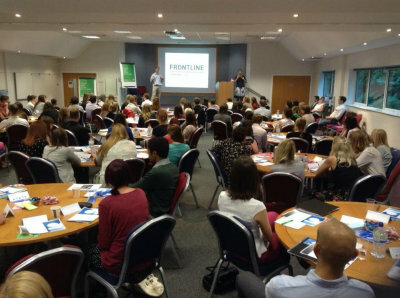 Controversy has dogged the graduate programme since it was announced and the scrutiny isn’t letting up now that Frontline has started its five-week residential summer institute, which is designed to get students ready to start their first placement. Forrester can understand social work academics’ wariness. He was himself sceptical of Frontline at first. “We’re trying something new – so new that when I first heard about it as a social work academic, I said: ‘This can’t work.’ And now I’m leading it,” he says. Concerns have included students only undertaking a five-week training period before going into a local authority placement and the targeting of graduates who may have their sights set on the civil service fast stream rather than being dedicated to working with service users long-term. This is a criticism that has been levelled at Teach First, a similar training scheme for teachers which some feared would result in graduates using the scheme to become a teacher before moving onto a more lucrative career. But as an early detractor of the Frontline programme, Forrester is well placed to identify with these critics and respond. Forrester feels the Frontline programme is unique in the level of support it provides participants after their initial training. They will receive 17 placement visits from their tutors, attend 22 recall days during which they return for ‘top-up’ training and are assigned an experienced consultant social worker to work with them on their cases. Like some academics now, Forrester had feared the participants would be “a bunch of management consultant wannabes and wouldn’t be suitable for social work”. “I was quite anxious about what they’d be like and so it was great to see that they have really good social work values,” he says. “They are really committed to helping people and to social justice. We’re bringing good people in who weren’t otherwise going to go into social work. Forrester acknowledges that Frontline will always sit alongside other models of teaching social work. “We need lots of different approaches,” he says. “I’m always reluctant to set us up as completely different from other courses because there’s an awful lot that every social work course will do – human growth and development, social theories, fundamental social work values. “But we have a particular heavy emphasis on teaching some core evidence-based ways of helping people. It’s early days, but Forrester says the feedback he has heard so far has been overwhelmingly positive, according to Forrester: “With innovative approaches you rarely get it right straight away. I can already tell you things that we would do differently. Did BASW’s statement on the Gaza conflict go too far?